The Red Army pioneered airborne operations but often failed to execute missions successfully. 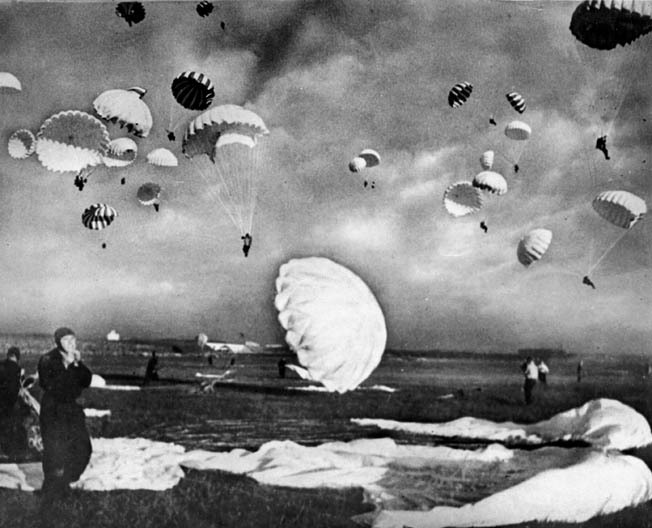 The official history of Russian and Soviet airborne forces began on August 2, 1930, when 12 parachutists were dropped during maneuvers in the Moscow Military District. Prior to maneuvers, the volunteers conducted several practice jumps during their six days of training under the tutelage of Air Force pilot Leonid Minov. Minov himself had only three jumps under his belt, having received his training in the United States only a short time before. This experiment created excitement among Soviet military theoreticians and commanders. The vertical dimension of airborne operations fit well within the overall framework of the Soviet “deep battle” concept, and the airborne forces expanded rapidly, numbering almost 10,000 men by 1935. That same year, during maneuvers in the Kiev Military District, 1,200 paratroopers were dropped in front of impressed foreign military observers. Airborne soldiers captured an airfield, allowing conventional infantry with light tanks and artillery to be flown in. When Germany invaded the Soviet Union, the Soviet airborne forces were an independent branch of the RKKA (Workers’ and Peasants’ Red Army), subordinated directly to the Supreme Command. There were 10 airborne corps of three brigades plus several small formations, with five more in various formation stages. Each brigade of 3,000 men consisted of four airborne battalions, a mortar battalion, antiaircraft machine-gun company, reconnaissance, sapper, and signal companies. The largest Soviet airborne operation of World War II took place during fighting around Vyazma in January and February 1942. Combat deployment of airborne soldiers began soon after the German invasion; however, missions were small in scale, tactical in nature, and for most soldiers it was a one-way trip. For example, on July 14, 1941, a company of 64 men from the 214th Airborne Brigade was dropped near Mogilev. Their mission was to destroy a small German convoy, which was halted to refuel. After engaging the enemy, 34 paratroopers returned; the rest were killed or captured. During 1941, airborne forces were often deployed in a regular infantry role. Only after the Germans were repulsed at Moscow and the Soviet forces went on the offensive at the end of the year did the airborne forces begin taking an offensive role. The largest Soviet airborne operation of World War II took place during fighting around Vyazma in January and February 1942. German forces were partially surrounded, and the Soviet command developed a plan to cut them off. Over a period of nine days, more than 7,300 paratroopers were dropped under adverse weather conditions. The operation was a disaster, with the majority of airborne troopers becoming surrounded themselves. The depleted survivors fought their way out during the next several months. After the Dnieper operation, there were further small-scale missions; however, the airborne forces continued fighting primarily in an infantry role. Airborne soldiers were dropped in actions against Japan in 1945 as well. In that theater of operations their missions were largely to secure territory rather than take it from the enemy. Tags Airborne Infantry, Allies, Axis, Eastern Front, Leonid Minov, Nazi Germany, Red Army, Soviet Union.